Priced: $148.99 - $249.00 Rated: - 5 stars out of 5 by 6 reviews. The Patagonia Women’s Merino Sweater Coat is a long sweater coat for cool walks along the beach. The 100% merino wool is soft and cozy, and the long length covers down to mid-thigh for additional warmth. The funnel neck keeps the chill off and large buttons wrap the basket-weave stitch around you for a slim fit. FEATURES of the Patagonia Women's Merino Sweater Coat. SPECIFICATIONS of the Patagonia Women's Merino Sweater Coat. 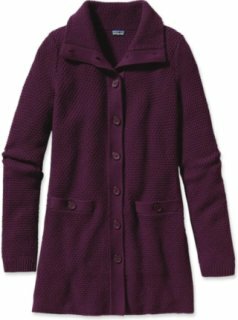 Patagonia Women's Merino Sweater Coat. Our soft merino wool sweater coat has a tall neck, princess seams, a button placket and mid-thigh length. Winter beach walks on the California coast are a favorite of the graceful Merino Sweater Coat. Flattering and warm, it’s knit in a basket-weave stitch using soft 7-gauge 100% merino wool, the mid-thigh-length sweater features a warm funnel neck that opens to a shawl collar, a front placket with button closure that regulates warmth, and two handwarmer pockets hidden on the seams. Front princess seams lend a feminine, drapey silhouette; fold-over cuffs at the sleeves provide styling options. Soft knit in a 7-gauge 100% merino wool. Elegant merino wool coat in basket-weave stitch. Funnel neck for added warmth, opens to lie flat across shoulders. Front placket with button closure. Small rib finish on the cuff of sleeves. Drop-in pockets with button closure. Falls to mid-thigh. Fabric: 7-gauge 100% extra-fine merino wool responsibly sourced from the grasslands of Patagonia. Weight: 624 g (22 oz). Longer and infinitely more classy than your average cardigan, the Patagonia Women's Merino Sweater Coat will keep you warm and looking good all winter. Its seven-gauge merino wool knit regulates your body temperature to keep you comfortable, and it isn't like regular wool that's itchy and heavy. The funnel neck keeps your neck warm on colder days, and princess seams have you looking long and lean. The small rib knit on the sleeve's cuffs finishes off this cold-weather masterpiece. 10 people have already set their own price. Bought this last year at the end of the season and I stored it for a while and now that it got chilly again it came out of the closet. The sweater is warm, cozy and lovely BUT just after wearing it only two or three times it began to unravel in a highly visible point at the front. I immediately took it to my local yarn shop and was lucky to find someone willing to work on it (for about 45 minutes) catching loops and crocheting and knitting the yarn that was quickly unraveling. The damage it's almost not visible now but I was highly disappointed that the yarn broke so quickly! I just received the Merino Sweater Coat in the mail after eyeing it for several months in the store. I LOVE this sweater-coat. Warm, silky-soft and a flattering fit open or buttoned. The length is perfect. Casually elegant, looks beautiful thrown on top of a t-shirt and jeans with boots. LOVE IT. It's expensive, but it's beautiful and practical, and that's exactly how I like to spend my money. Got it in the nickel grey, and can't wait to order the pale khaki. I'm 5'8" 160 lbs and the M fits nicely. I received this as a gift last year, and I have worn it non-stop ever since. I live in Northern California, so it is the perfect weight to be a sweater and a jacket, but when I wear it to Colorado it is slim enough that it layers nicely under my heavy jackets. It washes well on delicate cycle, then lay flat to dry. Definitely a slim fit, but long enough to cover my bum. As a whole, a wonderful addition to my wardrobe! I love the texture of the knit, the warmth without weight, and the lined pockets. However, I preferred the style of a couple years ago, with princess seams and pockets that went unseen along those seams. The patch pockets are less comfortable to rest my hands in, and the cut of the sweater is less flattering. Still, it's cozy, and will make for a nice outer layer in the spring. just purchased my second coat! i am wearing my khaki color today and decided i also need the plum... in a bigger size since I'll be growing and I can't live without this sweater. Worth every penny- mines been used and abused and still looks totally fabulous. Will keep me warm all fall and in to the winter. Soft and cozy. Fits well. I usually wear a small but the medium gave me room to wear bulkier clothes underneath. I'll have this sweater for years!